Will we commit our ambition to grow up and stand up to learn how to positively overcome the challenges of a changing world or will we allow ourselves to be beaten and depressed into a state of complaining and bitterness as a victim of circumstances? I’m learning daily to conscientiously and outwardly show more interest in others by engaging them in questions about their situations and their goals. I’m finding that people have allowed the cares of this world to overwhelm their sense of hope and faith and the ability to care about the needs of others. And if I can show true interest in them, perhaps it will lead them to search for the answers they really want so they can make a difference in their lives. And whether you’re talking to a believer or a pagan, whether you’re talking about health or money or relationships or beliefs, don’t you think he would be more inclined to dialog with you if he senses that you are authentically listening to him and engaging with him at the heart level? Why not ask people about their family, their work, their situation in life, their dreams and their goals. Don’t just ask “how’s it going?” Ask them how the economy is treating them. Ask them what they are doing to change their situation. Let them know you’ll help them with some ideas or suggestions when you find something that might be appropriate for them in their need. Everybody needs success in their life but not everybody is willing to do what it takes to reach it. There are four basic principles that you can help your kids and others to make a part of their daily lives. Associate with people who will help you achieve your goals. Find a proven plan that works and work your plan. Let’s focus on these priorities a minute. If you don’t have it clear in your mind what your daily actions are determined to produce you are destined to live in mediocrity and confusion, so why not decide today to change that? What is the catalyst for you to produce perseverance? I think many of us in adulthood have lost the excitement of living because we’ve given up on our dreams. Why not rekindle them? It will transform your future. And if you want to be a positive influence on others, why not ask them what they would really like to do if they had the time and money to do it? Wouldn’t you like to have the ability to give people a renewed vision to achieve what they really want in life? Maybe you need to be more specific about what you really want and write it down. That will be the catalyst for you to produce perseverance. And perseverance is one of the key factors that proves your character. Do you think that might be why God wants us to do whatever we do with ALL our hearts? Those with heart to persevere are those who know what they want and constantly work to achieve it. Secondly, as life beyond childhood gets increasingly cluttered with habits and the demands of others, we have to make better choices in the use of our only true wealth. What are you doing with your time? If you want the harvest you need to plant the seed. Be sure you’re not planting wild oats by letting activities fill your days that don’t support your goals and truest dreams and desires. King Solomon wrote: “He who walks with wise men becomes wise, but the companion of fools will suffer harm.” We become like those we spend our time with. Why else does a parent guide his child to choose his friends wisely? When we surround ourselves with mentors and coaches who care enough about us to keep us on track with loving correction we stay focused, energized and excited. The beliefs of others shape our own beliefs. Their courage, tenacity and optimism infect us to be relentless. When you ask someone if they are getting the results they want in any area of their life, the next question is “what are you doing to make a difference?” Once you have a proven plan to accomplish your desired result the question is simply “are you willing to work the plan?” If you don’t have the plan yet you need to be daily investing some of your time asking others for the road map to your destination. Once you find it, invest your wholehearted effort into working your plan and working with others to help them in the process. Our attitude is the rudder that guides our life’s journey. It guides our ability to overcome challenges. It helps us through crisis. “As a man thinks, so is he.” This is why we must consciously ‘renew our minds’ with the principles of God’s wisdom found in his Word. It’s like a lamp to your pathway. If we are willing to grow, willing to adjust, willing to think, and willing to reason with our Creator, He clearly gives us reason to have hope. Without Him, the circumstances of life in this world can overcome us with an attitude of hopelessness. Scripture is full of promises for us to grow, to succeed, to prosper, and to find blessing and joy while we are here. So what’s your attitude? Are you willing to change? By your attitude, you decide to read, or not to read. Let me recommend a book worth reading if you want to discover the time-honored principles of success. Jack Canfield (author of Chicken Soup for the Soul) and his team produced an epic called “The Success Principles.” It’s truly the best guidance system I’ve read to compliment the Bible in showing how to get from where you are to where you want to be. You’ll be equipped for life-changing new horizons when you let these timeless principles empower you to become a transformed person. By your attitude, you decide to try or give up. You’ll either take this challenge to change your behavior or you’ll write it off and reason that you’re going to remain stalled on mediocre. By your attitude, you will either blame yourself for your failure, or you’ll blame others. Our attitude determines whether we tell the truth or lie, act or procrastinate, advance or recede. And by your own attitude you and you alone will actually decide whether to succeed or fail. Did you ever stop to think how incredibly awesome it is that the God who created the complex and immense universe would create mankind and give to humans the free choice that would permit them to select their own achievement or their own destruction? Think about it. God in His infinite wisdom created an amazingly complex and productive world… but he deliberately gave humans the creative ability to develop His earth. Strange as it seems, God decided to partner with man to let us use our divinely brilliant gifts to invent and create endless enhancements for the benefit of other people! Across the rivers and streams he built no bridges. He left the pictures unpainted, the songs unsung, the books unwritten, and space unexplored. For the accomplishment of those things, God created the amazingly creative human who, within his heart and mind, had the capacity to do all these things and more, depending on his own choices. Your attitude determines what you will choose… and your choices determine your results. What an incredible gift… so much opportunity. All that we can accomplish and become has indeed been left to us. For as long as you continue to draw breath, you have the choice to complete the work in the earth and for yourself that God has begun for you. In all the seasons of our lives, attitude is everything! So… don’t forget the platinum rule. Show genuine interest in others. It’s the key to getting everything you really want in life. Learn to ask questions that show your sincere interest in the person you’re getting to know. You have two ears and one mouth. So work harder at trying to listen twice as much as you talk. That’s going to be a challenge for a lot of us… but work at it. People will love you for it. And that’s not all they will do. 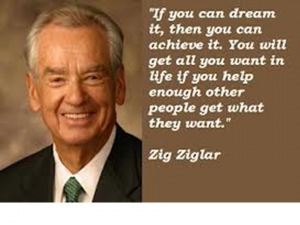 Remember Zig Ziglar? He’s one of the most respected Christian businessmen of our generation who has left a legacy that will continue to empower millions more people who hear him. Whatever you do, scripture prompts us to do your work with all your heart and to do it with the desire to please your Lord and not just please yourself. People who truly understand God’s purpose for their lives know that we are called to be intimately involved with one another. What is the path to reaching your most cherished desires of your life? Where do you think those deep seated desires originated? Desire = “of the father” **Isn’t it interesting that the word “desire” is made of two words? “De” means “of” or “from.” “Sire” means “to father.” Put them together and what do you get? Remember that we’re talking here in Psalm 37:4 about someone who “delights” in the Lord. He is making the Lord’s heart and will the focus of his very being. For the one who is intent on living in a state of delight in his Lord, what a thrilling discovery it is to find that the Lord is our Heavenly Father who created us for His good works and He has birthed in us the ability to have a vision and a desire for the things that He is pleased to give us. In today’s economic crisis, we will be wise to learn from the Bible. There is blessing in cultivating whatever opportunities the Lord puts in your hands and selling the product of your work. Learn what it takes to bring value to the market with your knowledge and skills. Learn how to engage those who want what you have to sell. Learn how to find those who you want to do business with. But most of all, learn to help others get what they truly want and in the process you will find your life to be fulfilled with the joy of fulfilling the platinum rule.